JetBlue recently launched its first business mentoring program —BlueBud (buddies + budding new companies) – to help other innovative companies learn what it takes to get their products onboard commercial aircraft. BlueBud participants receive special support from JetBlue’s business leaders, who offer access to the airline’s unique product development culture, as well as valuable industry insights. JetBlue has already helped put several small food brands on the map. In fact, the TERRA Blues potato chips have become synonymous with the JetBlue experience. The below timeline displays just a sampling of the brands we are proud to have brought onboard our planes. BlueBud gives us an opportunity to connect and support the next generation of small food companies whose values align with our beliefs and mission. Historically, airlines have not been associated with fresh and responsible foods. 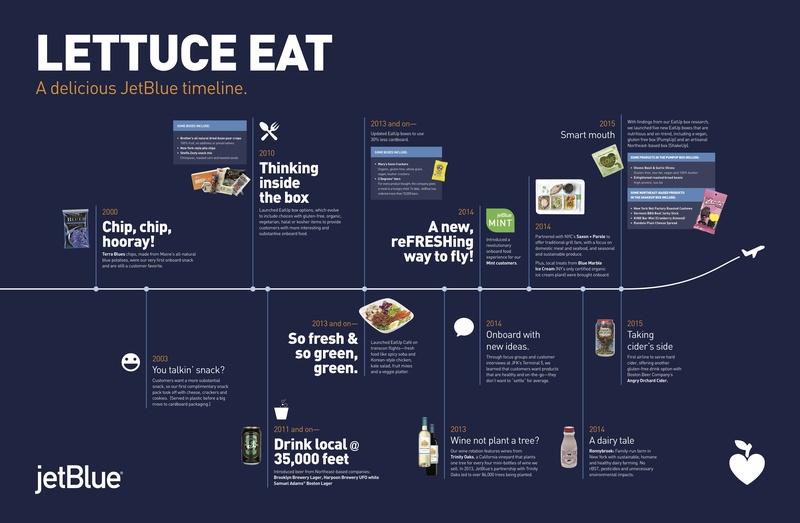 JetBlue’s product development and sustainability teams are working hard to ensure there are nutritious options available on all in-flight food and beverage menus. Items such as kale and quinoa salad on many transcontinental flights, as well as organic and sustainably produced Blue Marble ice cream in the JetBlue Mint experience, are just the beginning. We started with the goal of making a difference and even as we’ve grown, we haven’t forgotten our humble roots. We believe it is now our responsibility to help other small, like-minded companies. Even with our steady growth and many accomplishments since 2000, we haven’t forgotten what it’s like to start out small with a mission to innovate an industry. BlueBud will help companies connect with a diverse group of customers, all while maintaining responsible practices. The first program will focus on small food companies in New York State that are creating unique and novel concepts. For more information about BlueBud and JetBlue’s commitment to providing natural, healthy, and sustainable onboard foods, visit Jetblue.com/green/food/.